Anping District is a district of Tainan, Taiwan. In March 2012, it was named one of the Top 10 Small Tourist Towns by the Tourism Bureau of Taiwan. The older place name of Tayouan derives from the ethnonym of a nearby Taiwanese aboriginal tribe, and was written by the Dutch and Portuguese variously as Taiouwang, Tayowan, etc. In his translations of Dutch records, missionary William Campbell used the variant Tayouan and wrote that Taoan and Taiwan also occur. As Dutch spelling varied greatly at the time (see History of Dutch orthography), other variants may be seen. The name was also transliterated into Chinese characters variously as 臺窩灣, 大灣, 臺員, 大員, 大圓 and 梯窩灣. After the Dutch were ousted c. 1661 by Koxinga, Han immigrants renamed the area "Anping" after the Anping Bridge in Quanzhou, Fujian. Soon after Qing rule was established in 1683, the name "Taiwan" (臺灣) was officially used to refer to the whole island with the establishment of Taiwan Prefecture. 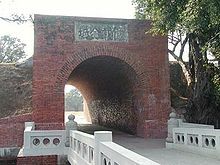 The history of Anping dates back to the 17th century, when the Dutch East India Company occupied a "high sandy down" called Tayouan and built Fort Zeelandia. The Dutch moved their headquarters to Tayouan after leaving the Pescadores in 1624. Due to silting, the islet has joined with mainland Taiwan. Koxinga's army brought an end to the Dutch colonial period via the Siege of Fort Zeelandia. In the Japanese period, the history of trade between China and Japan unfolded at Anping. According to the 1904 census, the city's population was 5,972. The district consists of Jincheng, Yuguang, Jianping, Yiping, Huaping, Pingtong, Wenping, Guoping, Yuping, Yizai, Pingan, Tianfei and Wangcheng Village. ^ 首長介紹 [District Chief Introduction] (in Chinese). Anping District Office. ^ Wong, Maggie Hiufu (30 Mar 2012). "Taiwan names its 10 top small tourist towns". CNN Go. Retrieved 2012-03-31. ^ a b Mair, V. H. (2003). "How to Forget Your Mother Tongue and Remember Your National Language". The true derivation of the name "Taiwan" is actually from the ethnonym of a tribe in the southwest part of the island in the area around Ping'an. As early as 1636, a Dutch missionary referred to this group as Taiouwang. From the name of the tribe, the Portuguese called the area around Ping'an as Tayowan, Taiyowan, Tyovon, Teijoan, Toyouan, and so forth. Indeed, already in his ship's log of 1622, the Dutchman Cornelis Reijersen referred to the area as Teijoan and Taiyowan. ^ a b Campbell (1903), p. 548. ^ Campbell (1903), p. 549: "The silting up of the land there has joined on to the mainland of Formosa a number of islets and sandbanks which were well known to the early navigators; one notable case being that of the small island of Tayouan, which is now quite a part of Formosa itself." ^ Takekoshi (1907), p. 200. Campbell, William (1903). "Explanatory Notes". Formosa under the Dutch: described from contemporary records, with explanatory notes and a bibliography of the island. London: Kegan Paul. LCCN 04007338. Takekoshi, Yosaburō (1907). Japanese rule in Formosa. London, New York, Bombay and Calcutta: Longmans, Green, and co. OCLC 753129. OL 6986981M. Valentijn, François (1903) [First published 1724 in Oud en Nieuw Oost-Indiën]. "History of the Dutch Trade". In Campbell, William (ed.). Formosa under the Dutch: described from contemporary records, with explanatory notes and a bibliography of the island. London: Kegan Paul. pp. 25–75. LCCN 04007338. Wikimedia Commons has media related to Anping District, Tainan. Note: Although Hanyu Pinyin is the national standard, Tainan names most of its districts by Tongyong Pinyin. East, South, West Central, and North district uses English instead. This page was last edited on 18 April 2019, at 05:00 (UTC).